Standard looking chess sets have been around for many decades. But this doesn't mean that your chess set should look the same as others. Wooden marble chess is interesting chess pieces.The picture showed its unique touch of knight pieces, which painted in marble. 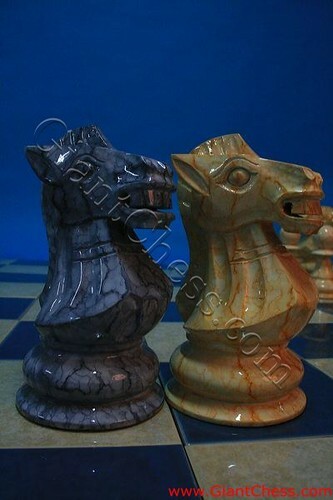 We provide beautiful chess sets in variety colors of marble. We also produce marble chess sets with all of the 32 chess pieces that are carefully handcrafted in marble and polished to a bright shine. Marble chess sets are a great decor. Adding a unique flavor of chess to any living room, bed room, work section, meeting room, and other room in your house or office. This wooden chess has made of Teak wood and polish as marble chess. So you do not need to worry if you use your wooden marble chess outdoor or indoor. Because Teak wood is famous as the strongest wood in the world. So you can play chess anywhere or you want to put it as outdoor decor. By this wood, your chess pieces is very durable.